Weldok® Steel Stair Tread is a strong, durable, perforated steel tread ready to install. 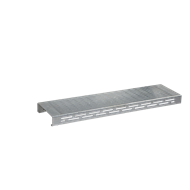 The tread is 50mm thick and 1000mm wide and used with Weldok® Stair Stringers meets relevant BCA requirements. They are hot-dip galvanised to Australian Standard ASI/NZS 4680:2006 for long life.